MacLux Pro is one of the first dedicated software applications to link the process of drawing a light plot with doing the paperwork and writing cues. MacLux was originally introduced as shareware in 1991. It featured the ability to draw a light plot and enter information attached to objects in the drawing. A separate application called PaperWork compiled reports from a MacLux plot file. MacLux Pro was first released in 1992 and combined those functions in a single multi-window application. MacLux was originally written on a MacPlus computer using Think Pascal. It ran under the original Mac OS System 6 on a Motorola 68000 family processor. MacLux Pro was re-written when Apple switched to the PowerPC family of processors. It was also modified to run under OS X when it replaced Mac OS 9. MacLux Pro continued to run on Apple computers when they switched to Intel processors using the emulation technology called Rosetta. OS X 10.7 Lion dropped support for Rosetta and PowerPC software and MacLux Pro would no longer run on new Macintosh computers. In 2006 a new project called the LXSeries was started based on the concepts and conventions pioneered by MacLux Pro. The first LXSeries application, LXFree, is much like the original MacLux in that it combines drawing a plot with entering information attached to objects in the plot and using that information to produce reports. LXFree was written from the beginning for OS X. But, the LXSeries uses software techniques that are extensible and applicable across operating systems. This means that the future of LXSeries applications is not tied to a single operating system or family of processors. In 2010, LXSeries Pro was released. LXSeries Pro is centered around LXBeams which adds beam display and rendering capabilities to the basic drawing and paperwork of LXFree. While MacLux Pro encapsulated plot, reports, and cues into a single environment, LXSeries separates the cuing portion into a standalone application called LXConsole. LXConsole communicates with LXBeams via AppleScript. So, you can transfer your patch from your plot to LXConsole. And, LXConsole can be used to control the rendering of lights in LXBeams. The advantage of separating this into two applications is that LXConsole can be used as a general purpose cue editor or lighting controller without the need for an accompanying light plot. LXFree and LXConsole are free applications and can be found at the LXSeries website: lx.claudeheintzdesign.com. You can also download to try and/or purchase a license for LXSeries Pro which includes LXBeams from the same site. MacLux Pro does not run on OS X 10.7 and later. The final version, 2.2 has the ability to export .lxxplot files. This file format is an XML based format that can be opened by LXFree running under OS X; by LXFree for Java running on either Windows or Linux; and by LXBeams for iPad. As of March 15th, 2015, MacLux Pro 2.2 is available as a free download. 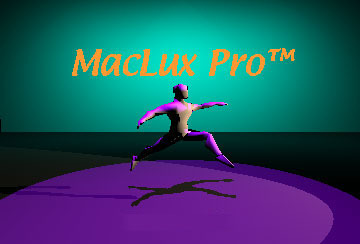 To download MacLux Pro for OS X 10.6 and earlier, click here.